It's been nearly two months since I came home from Ireland and I'm finally getting life together enough to start writing about it! 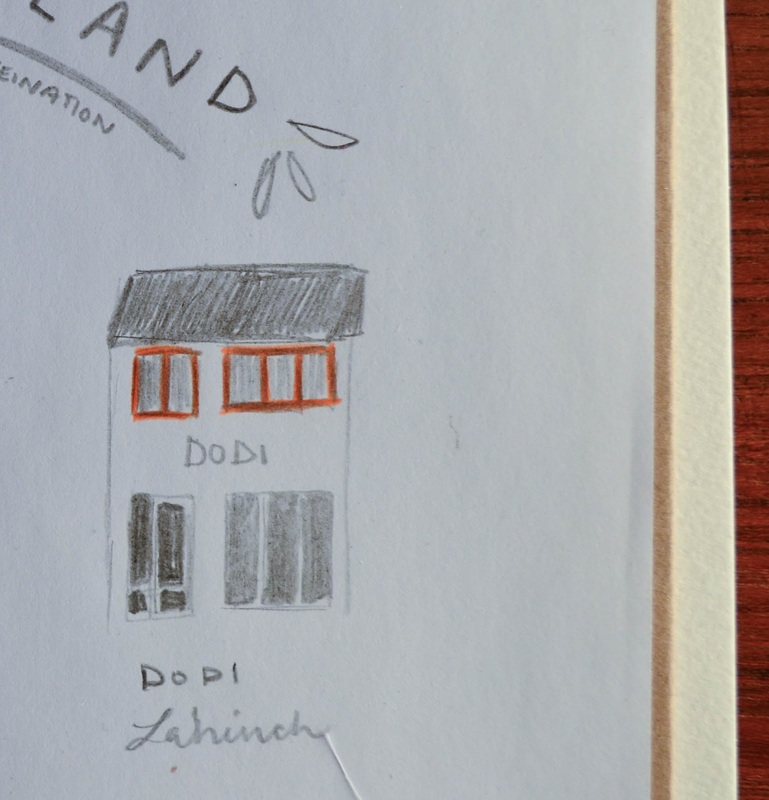 This endeavor definitely deserves some caffeine so of course we're going to begin by throwing together an illustrated travel guide to to coffee along our route. Besides a clean bed to sleep in at night and a rolling suitcase, what could be more essential to comfortable travel than being properly caffeinated? Contrary to my life now, I can remember the first time I ever walked into a Starbucks - it was the first coffee shop I'd ever been to in my life (if you can call Starbucks a proper coffee shop). Growing up we had this arbitrary rule that you couldn't drink coffee until you were thirteen, and even then you could only drink coffee while on a camping trip. Now, of course, my coffee habit is so pronounced that the manager of my favorite coffeehouse asked me to paint the trashcans and I frequently have dinner with one of the baristas and his wife. In America we're used to seeing coffee-shops on every corner - if not a craft coffeehouse, a Starbucks. If not a Starbucks, a walk-up counter with takeaway coffee. Ireland was a bit less this way the farther we traveled from hubs like Dublin, Galway, and Belfast, but we still managed to find and enjoy a wealth of coffee shops as we made our way through the Republic of, and Northern Ireland. Everyone where enjoys a good latte, but drip coffee, pour-overs, French press, and the like are still well and alive in America's coffee scene. It makes sense - the equipment needed to make and sell good drip coffee is a lot cheaper than that needed to make and sell good espresso drinks, so I was surprised to see that in Ireland, this was not so. No matter where we went, we noticed the complete absence of "filter coffee" as they call it. One could order an americano (espresso + boiling water) to mimic filter coffee, or ask for "black coffee" which is an acidic witch's brew of instant coffee granules and a sludge of hot water. But in no place could we find typical, American-style coffee-pot coffee. I don't know what the Irish consider the best part of waking up, but one can be reasonably assured it is not Folgers in their cup. Instead, the coffee shops in Ireland were like espresso kings. I don't care how small the lunch cafe was, you could always depend on there being a tiny espresso maker and the possibility of a cappuccino. Not only is espresso readily available in Ireland, but there are various choices to be made about the espresso itself. 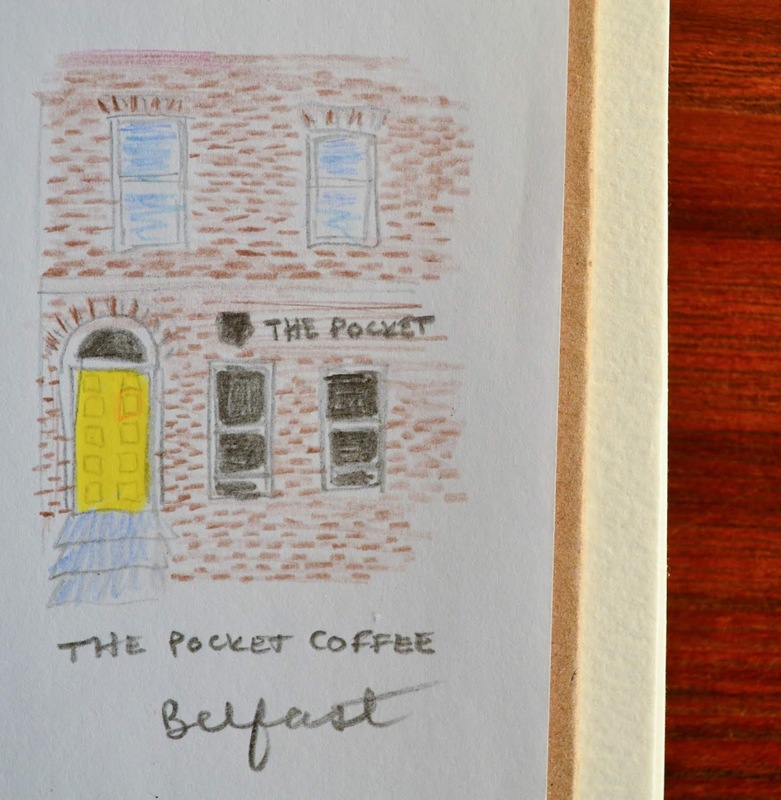 Much in the way an American coffee shop would offer different single-origin beans as choices for a pour-over, some of our favorite Irish coffee shops wanted to know which espresso we preferred. Maybe I've been living under a rock or down some blissful hollow of ignorance, but I have never walked into a coffee shop in America and been asked what sort of espresso I wanted. Okay, unless (ironically) it was Starbucks which now offers an option for blonde espresso. Being able to choose a latte pulled with a different sort of espresso made for some pretty awesome latte experiences - like all the flavor of a Chemex pour joined to all the comforting microfoam of a cortado. I'm a fan. And just because the shops were so satisfying, I collected them up to give you a proper introduction! Howth was one of my favorite stops while on the East coast of Ireland. A short train ride from the heart of Dublin took us to the little seaside village of Howth with its pier ribbed by seafood restaurants, its perfect views, and long, stone walk out to the lighthouse. After a long, hungry cliff-walk we ended with lunch at Beshoff's and then caught a coffee at dusk from Bodega. 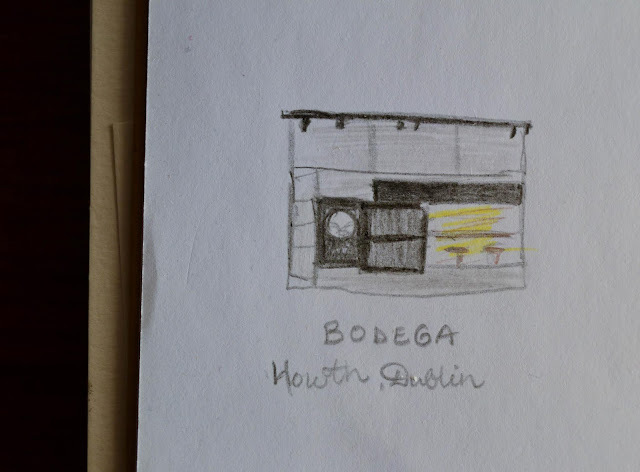 Bodega is a tiny place - barely more than a glass-encased counter with perhaps three barstools - but the barista made us feel right at home and poured some great lattes that we took with us on the DART back home to Dublin. My favorite part was when he asked what Americans call americanos, and when he told us that all of the vegan baked goods for sale really tasted like "health food." 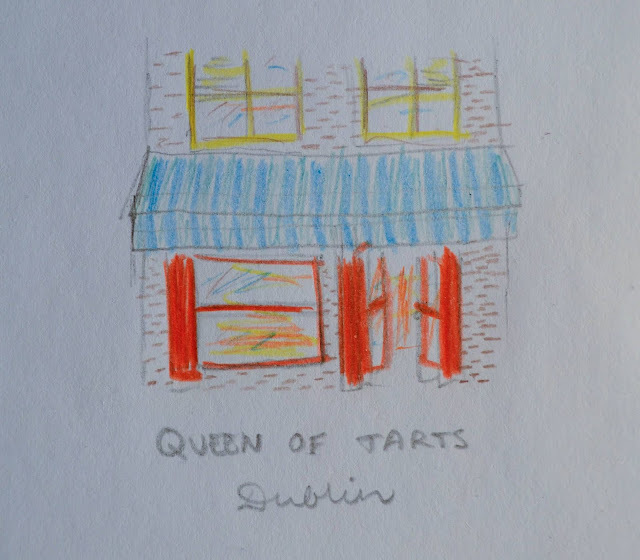 Although technically a small chain of cafes, Queen of Tarts in Cow's Lane was nearly directly beneath our Air Bnb which made it even more attractive than it already naturally is. The glass-fronted bakery cases are stuffed with truly magical-looking pastries and the interior decor is a little madcap, a little gaudy, like you're sitting a tea party with Alice and the White Rabbit and maybe a dodo or two. The menu has a full range of brunch and lunch options and their pastries made a perfect companion to their quite-good espresso. My favorite part of Queen of Tarts was probably the skill-level clearly shown in the available cakes and tarts and pastries as well as the friendliness of the staff. Our waitress plopped down beside us in the window-seat to ask a question she'd been "burnin' to ask" about Donald Trump. Sure, it would've been fun to leave Trump out of such a relaxing atmosphere, but she was full of lively suggestions on how to spend our time in Dublin and we didn't mind. Galway is such a fun town. It's delightfully walkable, full of odd twists and turns, the best toy store I've ever seen, modern and ancient corners, tiny crepe shops and minuscule bakeries. And we bee-lined to this bright white and yellow coffeeshop in the middle of one of Galway's most popular shopping streets. 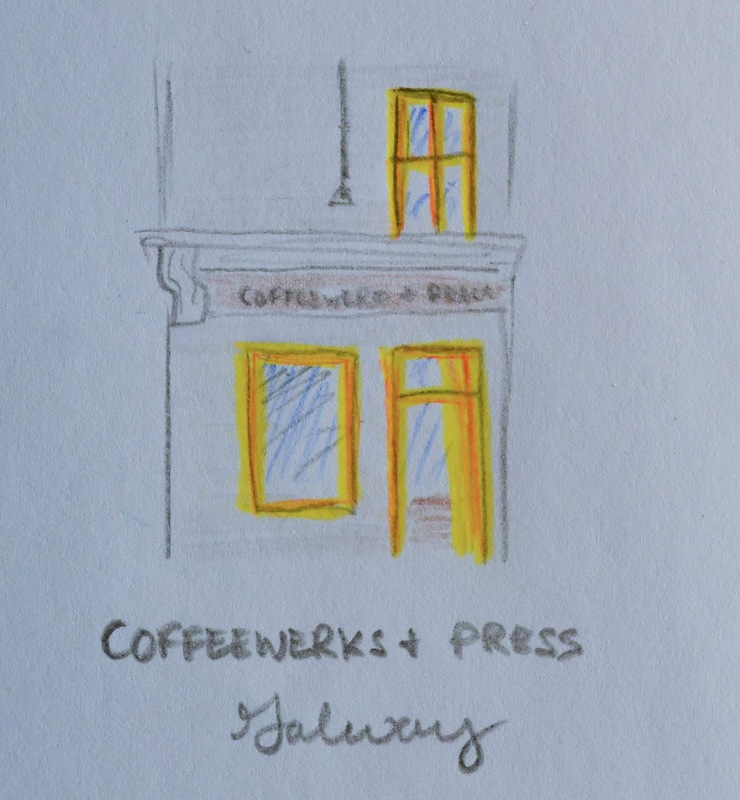 Out of all our stops in Ireland, Coffeewerks & Press was the only one we had ferreted out before leaving the US. 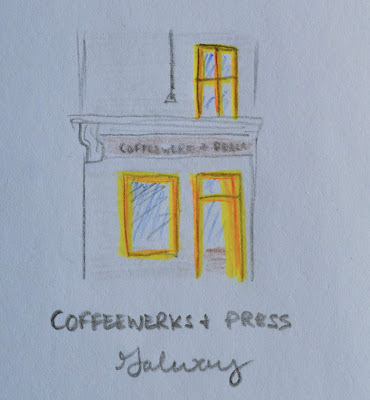 It is very small, like most coffee shops in Ireland, but evidently contains an upper floor where it is possible to sit and enjoy a coffee date. The takeaway cups were perfect for our group, however, as we had a full day of exploration in Galway to get on with! And besides - I've never seen any branding quite as cute as the illustrated sleeves for Coffeewerks' cups. One thing I loved about this stop was the fact that they also sell really beautiful paper goods. It took all my self-control not to buy another journal, even though I had plenty of pages left in the travel journal I'd brought. Such a sucker for beautiful, blank things. Ugh. 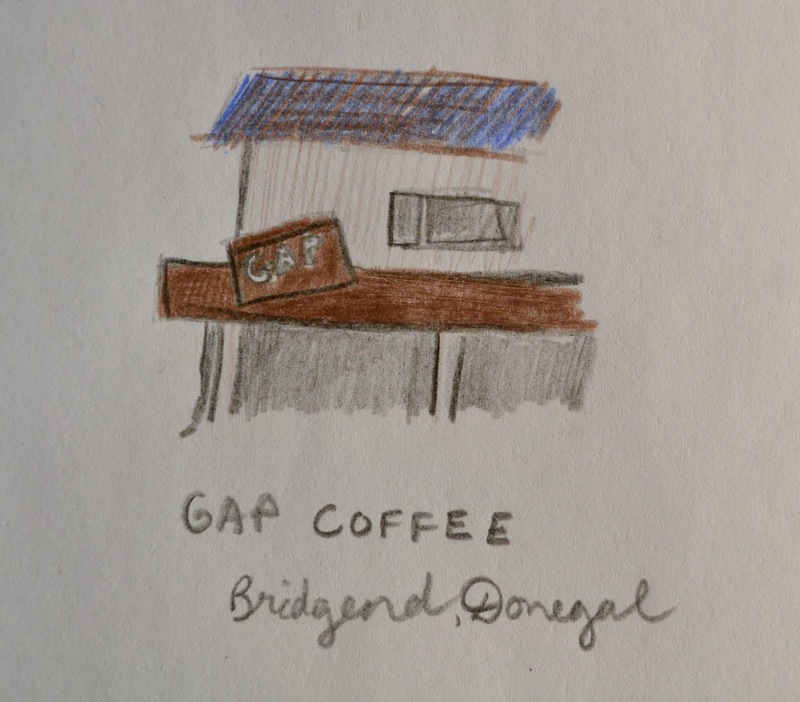 Our visit to Gap Coffee happened after we'd climbed Grianan of Aileach, a first century fort with sweeping, dramatic views of Lough Foyle, Lough Swilly and the entire surrounding peninsula. We were freezing, surprised to find coffee in what felt like the middle of nowhere, and extremely gratified to walk into this spacious, friendly cafe right before closing. The staff were as friendly as we'd come to expect Irish customer service to be, and they didn't seem to mind at all that we came in to order drinks five minutes before they closed down for the night. This sun-lit, cozy, sprawling coffee shop was another favorite stop. This one is actually in Northern Ireland, midway between the Carrick-a-Rede rope bridge (thrilling) and Giants' Causeway. Again, it cropped up on our notice quite unexpectedly, right as we were most wishing we'd be able to find coffee and thaw out (plus swallow some liquid courage) after our excessively windy crossing of Carrick-a-Rede. 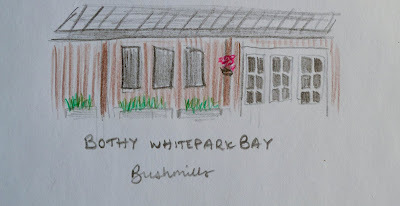 There Bothy was: welcoming, insanely homelike, staffed by people who instantly felt like friends and were able to give us personal favorite suggestions for our travels to Belfast the following day. 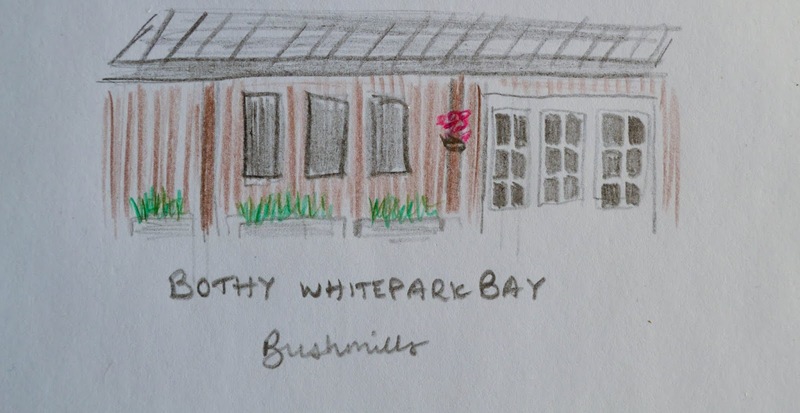 The coffee was brilliant, but it was the turf fire burning in the stove, the hiss and puff of espresso and milk, the couple bursting through the doors and laughingly telling their engagement story to the staff behind the bar, that made me wish with all my might that Bothy wasn't an ocean away. Oh my gosh. 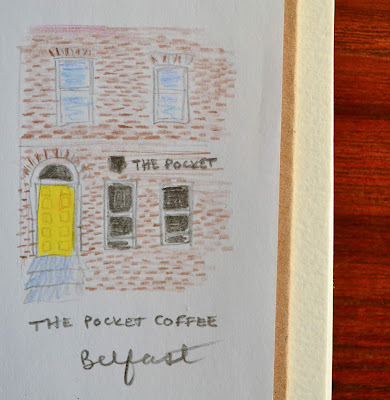 If you're into making random friends all across the world and standing up to drink down a cappuccino in a Tiffany blue cup while talking to your new pal behind the bar, then The Pocket Coffee in Belfast is the place for you. From the minute I clamped eyes on the bright yellow door, I knew I'd found my favorite haunt of the trip. (So, I lump Bothy Coffee in with this place because they're more friends than rivals and we can all hang out together, okay? Okay.) Pocket Coffee sits directly across the way from Queen's University but, unlike some disappointing places I've experienced in my time, doesn't feel anything like a college campus coffee shop. We dawdled up to The Pocket after traipsing through the Botanic Gardens (highly recommend, even in November) where we bothered the rose gardener and hunted through a glass conservatory. The guys here not only knew their coffee and walked us through the entire realm of espresso-related choices to be made, but then stood about and talked to us for twenty minutes straight. After ten minutes one of them gave us permission to sit down and stop talking if we wanted to, but also hinted that they loved to talk and would gladly keep chattering on (the four of us, the two baristas, then random customer to our right) for as long as we could stand there. We'd a tour scheduled at Belfast City Hall and so, unfortunately, had to leave long before we were ready. But the minutes we spent there are yet another reason to mourn the entire Atlantic stretching lazily between my house and The Pocket. And there we have it! 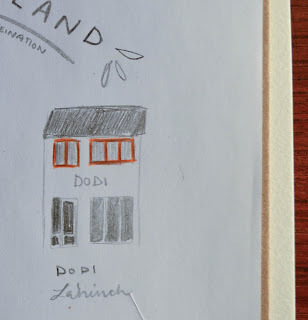 We drank coffee at several other places along the way, most often accompanying our meals at places that didn't specifically fit the coffeeshop genre, which is why we didn't include them here. I hope you'll find this list helpful if you're traveling through Dublin, or following a route like ours and cutting West across the country before traveling the length of the Wild Atlantic Way. If you've been to Ireland, which spaces did you visit for caffeination? I'm always taking names. Cheers, y'all! Filing this under information I need to know. 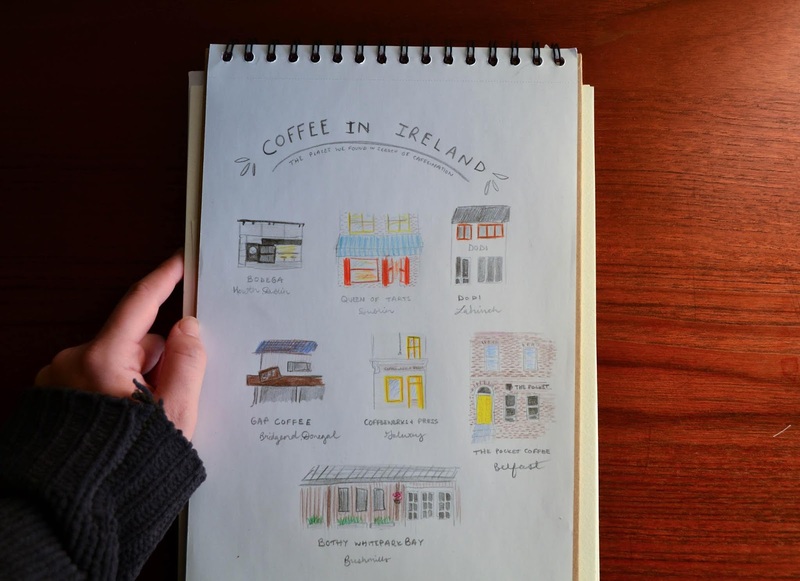 I really want to go to Ireland someday and being a coffee fiend. This is exactly the kind of travel guide I needed.